In the wake of hitting a three-run grand slam to center field for the Yankees' first keeps running of 2019, Luke Voit pondered his place in the Opening Day batting request — fourth behind Aaron Judge and Giancarlo Stanton. Voit called the 6-7, 282-pound Judge and the 6-6, 245-pound Stanton "advanced superheroes." What does that make the 6-3, 225-pound Voit? "The infant of the gathering," Voit said. Goodness, infant! Voit drove in four keeps running as the Yankees opened their season with a 7-2 triumph over the Orioles at Yankee Stadium. 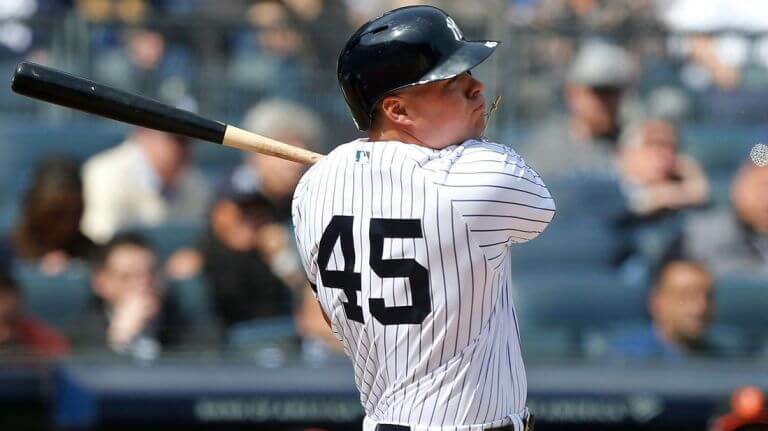 Voit got the Yankees on the board with one swing of the bat in the base of the main, hitting a 428-foot grand slam off the glass overhanging Monument Park. "I just swung the bat twice today," said Voit, who was hit by a pitch with the bases stacked and strolled twice for an ideal 1-for-1 opener as the assigned hitter. "It feels great to get off to a decent begin, and it was a ton of fun today." It was a fun day for the Yankees, who steamrolled the understaffed Orioles before a sellout horde of 46,928 that hollered "Luuuuuuuke" from the minute No. 45 was declared amid pregame presentations. "It's entirely great," Voit said. "It's insane how they took me in, and I trust they don't boo me away too speedy since I know it's New York." If he continues doing what he's doing, those Lukes won't change to boos at any point shortly. The boos were held for Greg Bird, who struck out multiple times before homering off lefthander Paul Fry in the eighth. Flying creature made the Opening Day list due to the damage to Aaron Hicks. Voit was going to make it in any case. "It's amazing," Voit said. "Who might have thought I'd be here for Opening Day?" Most likely not Brian Cashman, presumably not even in the general supervisor's most out of this world fantasies when he procured Voit from the Cardinals last July 29 alongside worldwide reward opening cash for pitchers Chasen Shreve and Giovanny Gallegos. Did Cashman realize he would get a player who might hit .333 with 14 homers and a 1.095 OPS in 39 recreations down the stretch? Did he know he'd get a player who lined it up with four grand slams and a .943 OPS in spring preparing? On the off chance that he did, at that point, Cashman is genuinely a virtuoso. Consider the pantheon of incredible Yankees cleanup hitters: Lou Gehrig. Joe DiMaggio. Reggie Jackson. Alex Rodriguez. All right, OK, we won't escape — yet. Be that as it may, the legend of Luke just developed after he went to the plate in the base of the first. Voit fits the vibe of the conventional cleanup man: enormous, muscular, with protruding biceps and capacity to save. Keep in mind that old sketch of Bugs Bunny playing baseball in an arena that was a mix of the Polo Grounds and old Yankee Stadium? Voit would fit right in with the beefy "Gas House Gorillas," a group of rough looking, stogie eating sluggers who Conga-fixed their way around the bases with (truly) shouting grand slams until Bugs came in to "confound them with my slowball." One-two-three strikes yer out! One-two-three hits yer out! One-two-three hits yer out! However, what worked for Bugs didn't work for Orioles pitchers. In the primary, starter Andrew Cashner fell behind 3-and-1 preceding tossing an 87-mph. Voit kept it where unremarkable slowballs are bound to go, and the Yankees had a 3-0 lead four players into the principal base of the first of 2019. Voit, with a possibility for another three-run homer in the third, instead demonstrated the control to go for a stroll to stack the bases. The Yankees scored another keep running on Miguel Andujar's twofold get it done to go up 4-0. The bases were stacked again when Voit confronted Mike Wright in the fifth. Wright hit Voit in the left elbow with a pitch to make it 5-1 and give Voit a four-RBI day. Voit strolled again in the seventh. "What daily," supervisor Aaron Boone said. "Only incredible at-bats." "It's mind-boggling," Voit said. "Who might have thought I'd be here for Opening Day?" Most likely not Brian Cashman, presumably not even in the general director's most out of this world fantasies when he gained Voit from the Cardinals last July 29 alongside worldwide reward opening cash for pitchers Chasen Shreve and Giovanny Gallegos. Did Cashman realize he would get a player who might hit .333 with 14 homers and a 1.095 OPS in 39 amusements down the stretch? Did he know he'd get a player who lined it up with four homers and a .943 OPS in spring preparing? If he did, at that point Cashman is genuinely a virtuoso. Consider the pantheon of extraordinary Yankees cleanup hitters: Lou Gehrig. Joe DiMaggio. Reggie Jackson. Alex Rodriguez. All right, OK, we won't escape — yet. In any case, the legend of Luke just developed after he went to the plate in the base of the first. Voit fits the appearance of the conventional cleanup man: enormous, bulky, with protruding biceps and capacity to save. Keep in mind that old drawing of Bugs Bunny playing baseball in an arena that was a mix of the Polo Grounds and old Yankee Stadium? Voit would fit right in with the beefy "Gas House Gorillas," a group of whiskered, stogie eating sluggers who Conga-fixed their way around the bases with (truly) shouting homers until Bugs came in to "confound them with my slowball." One-two-three strikes yer out! One-two-three hits yer out! One-two-three strikes yer out! Be that as it may, what worked for Bugs didn't work for Orioles pitchers. In the principal, starter Andrew Cashner fell behind 3-and-1 preceding tossing an 87-mph. Voit saved it where average slowballs are bound to go, and the Yankees had a 3-0 lead four players into the main base of the first of 2019. Voit, with a shot for another three-run homer in the third, instead demonstrated the control to go for a stroll to stack the bases. The Yankees scored another keep running on Miguel Andujar's twofold take care of business to go up 4-0. "What daily," administrator Aaron Boone said. "Only extraordinary at-bats."